During a new CRM 2011 installation using IFD/ADFS we had everything running properly for a about a week and then IFD access broke. Users could no longer connect via Outlook. They were all getting the following error message. Where the HTTPS://uniquename.domainname.com:444 was known to be correct as we could login via IE. We confirmed issues 1 & 2 in the KB and checked the resolution. 1. 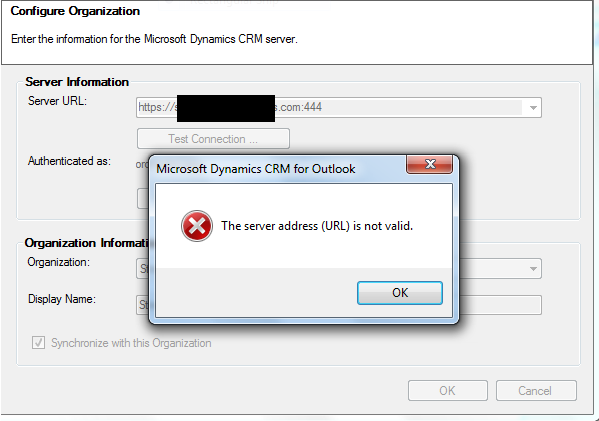 Anonymous Access is disabled on the CRM web site. 2. The Web Address URLs specified in the Deployment Manager do not match the CRM URL in IIS. The resolution in this KB was to check the Site Bindings and ensure thaat you only have on http: and/or one https:// binding type. We checked and we only had one of each. But since we weren’t using the HTTP:5555 url anymore we removed it and then we could connect via Outllook. 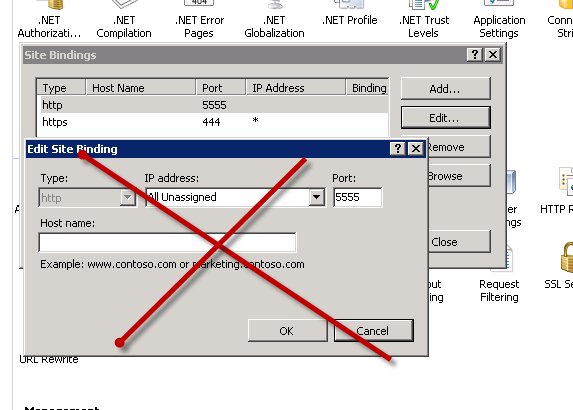 So the answer at least in this situation was that if you don’t need the legacy binding any longer – remove it and it could solve the Outlook configuration issue.